When Lily was 10 months old, we spent time in Southern Illinois, an unlikely destination for a vacation. 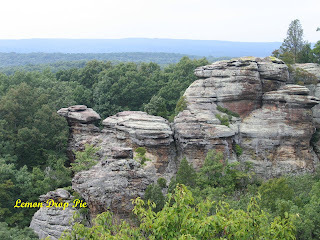 Last week, I wrote about Effingham, Giant City State Park, and an old Stone Fort. Let’s face it, when you are traveling with a baby, you don’t always get to see what you want to see. 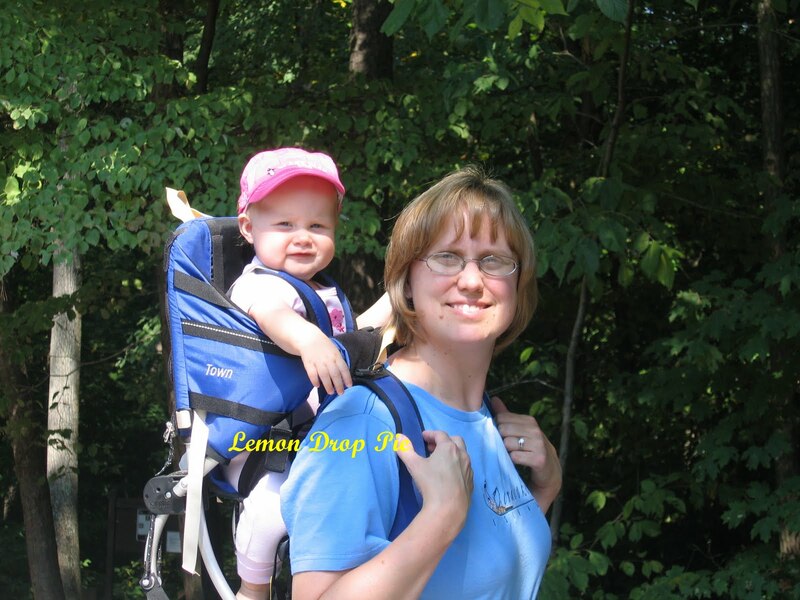 Ed and I were all set to hike to the bottom of the Little Grand Canyon in the Shawnee National Forest, but with a baby on my back, the trail down was a little to narrow and right on the edge of the bluff! We decided to turn around, and never did make it to the bottom of the canyon. The name Ferne Clyffe itself brings to mind images of green mist and steep bluffs; a place where you might encounter Robin Hood and his band of Merry Men and be whisked away into another world. It so happened that the day we ventured into Ferne Clyffe State Park, it was overcast and rainy. The flora and fauna shimmered a dark green that morning, and a mist did seem to rise from all the wet rock faces. The sun came out eventually, and we had a beautiful hike. We also stumbled upon another giant cross, Bald Knob Cross. The original purpose of this cross was to serve as a place for people of all denominations to worship. For the last part of our stay in Southern Illinois, we traveled to Elizabethtown and spent a couple of nights in the historic Rose Hotel, which is located right on the Ohio River. This hotel was built around 1830, and while it is owned by the state of Illinois, it is still open as a bed and breakfast. Staying at the Rose Hotel was like taking a step back in time. The rooms were decorated just as they might have been in Victorian days, and the covered porches were very inviting. We could have lounged all day, just watching the river glide by. This was the view from our room. But lounge we did not; we still had two major sites to visit; Garden of the Gods and Cave-in-Rock. If you have lived in Illinois all your life, as Ed and I have, you are amazed that something this incredible exists in our flat, farmland state. River bluffs are one thing; Garden of the Gods is another. As Ed and I hiked this simple trail, we didn’t know what to expect, and the beauty of the sandstone sculpted by nature took us by surprise. Cave-in-Rock is on the Ohio River, and pirates used to live in this cave (really!) and highjack unsuspecting travelers on the river. We found so many fun places to visit during our stay in Southern Illinois, and I haven’t even told you about the Golconda Shrimp Festival! We loved the planned AND unplanned adventures that we had on this trip. But most of all, we loved spending time together as the new little family that we had become. This was a wonderful trip. I love seeing places in across America that are so beautiful and I didn't even know about. Those are some lovely photos. I've only been outside of Florida once myself, but Illinois looks like a fabulous place to visit. The best shot is the one of that sweet sleeping baby face. Look at those cheeks! Awww. . . it's hard to believe that pudgy little face is now a skinny 5-year-old!